After living in Milwaukee, Wisconsin for two years, I became keenly aware that building a new artistic home takes time and requires the collective labor beyond what I (or any one person) can create or produce. I also realized that what was missing in my new home was a space to experiment outside of produced and curated events. So much work is made and performed to fit into structures that produce culture, fit neatly into mission statements, balance aesthetic choices with calendars, and craft artistic identities. Not all but most performance come into existence this way. While I celebrate some (at times) and engage with all of these parameters, I know that the growth of ideas and the exchange of artistic practices need a space dedicated to the unknown, the unruly, and certainly the unexpected. Starting Hyperlocal MKE with Tim Russell my 3rd year in Milwaukee commemorates a commitment to experimentation. Hyperlocal MKE is a mobile space where artists gather to explore improvisation methods and practices. It is also a space to reveal to audiences the knowledge, work, play, curiosity, commitment, and letting go of commitments, which are in conversation with every moment of the live compositions. This kind of improvised performance practice, created with colleagues that may or may not share my opinions, recruits a kind of suppleness with knowing. In the Hyperlocal improvisations, knowing evolves into not knowing, so that the unknown becomes what we pay attention. I delight in spontaneous performance as a practitioner and as a viewer. My desire to bring audiences into conversation with these spontaneous choreographies and compositions preserves a case for unfixity. I believe (as do all that I perform with) that improvisation practice needs exchanges with viewers. In each Hyperlocal MKE exploration, we the performers and you the viewers, make our own meanings. Side by side, we explore our own ideas that are *immediately in conversation with other ideas, and we observe together how these sounds, spaces, movements, relationships, sensations, and permutations evolve right under our fingertips. Maria Gillespie, artistic director of Oni Dance and Assistant Professor of Dance at UWM and Tim Russell, composer and Music Director of the Dance Department at UWM team up to present Hyperlocal MKE – Improvisational Contemporary Performance. Gillespie and Russell bring together local composers and choreographers to create spontaneous performances at different spaces in Milwaukee. Hyperlocal and the collaborating artists share the mission to create an active environment for local performing artists to research, to experiment, to invent, and to share moving and music with their community. Interdisciplinary and experimental at heart, Hyperlocal is a gathering of artists to create, converse, and improvise. Placing the local as a priority in context of the global, these performances invest in experimentation as a centrifuge for cultural individuation that is in conversation with the world. Each performance of Hyperlocal will feature a different roster of improvising artists focusing their sound and movement scores on a central theme. 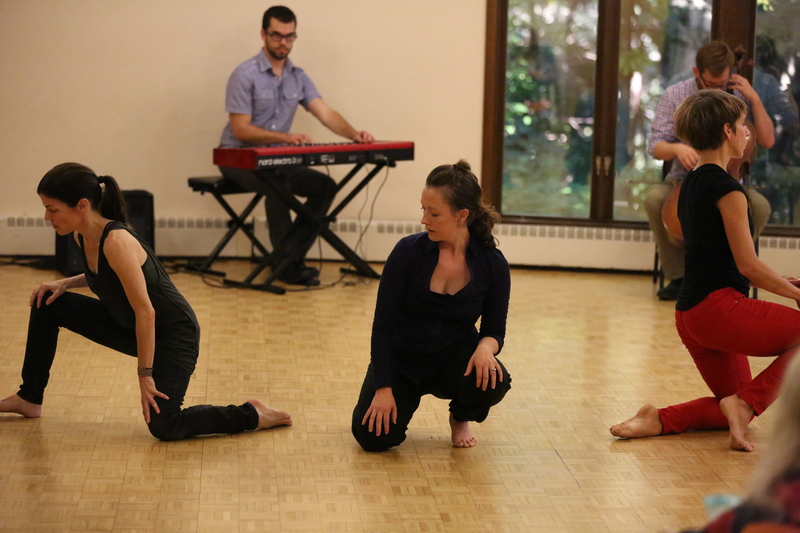 The first performance was at Milwaukee Quaker Friendship House on September 28, 2014 at 4pm. Hyperlocal #4 – T U N I N G new date! April 26th!